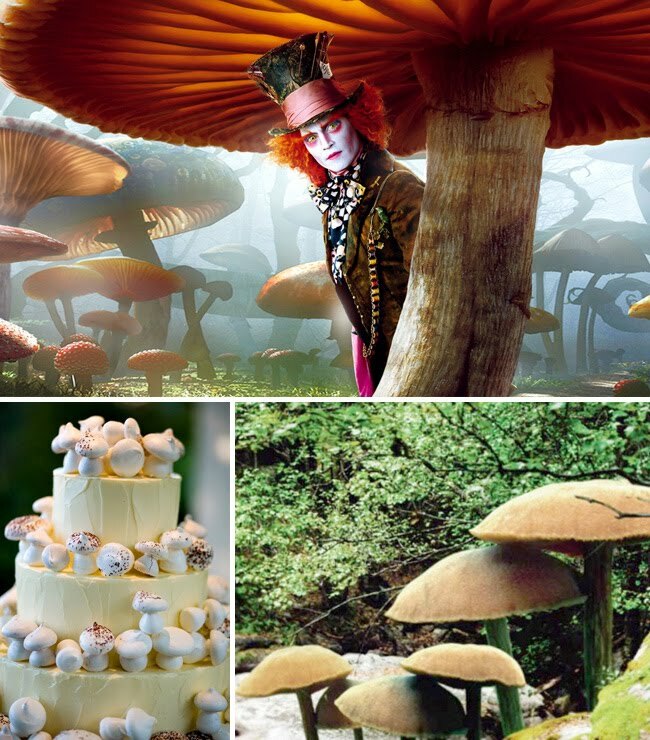 With the week of movie posts, and the much anticipated Tim Burton’s version of Alice In Wonderland opening today, I of course had to do a post on wedding ideas from Alice in Wonderland! I’m sure we will see some nominations for this film at the Oscars next year. I can’t wait to see the movie this weekend, so here are some fun + creative ideas you could use for your wedding. A gorgeous blue ruffled wedding dress, quirky groomsmen, and cute little flower girls. I picture the ceremony near cherry blossoms, with a fun clock necklace. Empty frames line the aisle and a white rabbit on the invitations to announce the date. After the ceremony a fun, whimsical tea party! Mismatched chairs, lots of clocks and mismatched plates and cups. Little sandwiches, desserts, and yummy tea. I kind of love the idea of a huge blue bow for the bride. I totally think this could work great for a bridal shower also and turns out I’m not the only one. Check out this super fun Alice inspired bridal shower featured on The Wedding Chicks yesterday. The hubby and I are planning to see Alice in Wonderland in 3D this weekend, then we have the Oscar’s Red Carpet to watch on Sunday mixed in with lots of work on the new site! Fun and busy weekend. Anyone else planning to see Alice this weekend and/or excited to see all the fashion on Sunday? Also, if you are in the LA area, there is a cool event going on at the Royal/T Cafe all through March – Alice in Wonderland High Tea with Playing Cards Tea Sandwiches, ‘Eat Me’ Cupcakes, ‘Drink Me’ Special Royal/T Green Milk Tea blend, and Deep Purple Macaroons! And if you need some music inspiration today, you can listen to the full album preview of Almost Alice here. Music inspired by the movie from Metro Station, Owl City, All-American Rejects, Robert Smith and lots more. I listened to it while collecting images for this post and loved it. Happy Friday! LOVE this! can't wait to see the film. This would make such a fab wedding with 'eat me' cakes, playing cards for the table numbers, 'painting the roses red' bouquets – perfect! Love the boards! Such fun post all week on the movies! Another delightful movie post! Love love this series. the mushroom cake is just too cute! you could not have selected better pictures of Johnny under that mushroom ! omg its priceless. Oh my goodness. This is the most beautiful thing I have ever seen! Of course, I could be a little biased considering this is the theme of my own wedding in July. :) I am using the exact invitations you have posted, and I just found the cutest heart necklace/watch at American Eagle for under $20. I have this board saved to my favorites and I will definitely be using it for visual inspiration! that dress is to die for! the source site just says many designers made the dress :( i wish it was mine! Such a delightful theme! I think I'll be using a few of those ideas for my seven-year-old's tea party birthday next month! Thanks for the inspiration! I absolutely love it. That mushroom cake is to die for! This is great! I especially love the mushroom cake and all the clocks and the table! I saw Alice at midnight and then again that night and it was great both times! LOVE this series of inspirations from movies! Thank you! 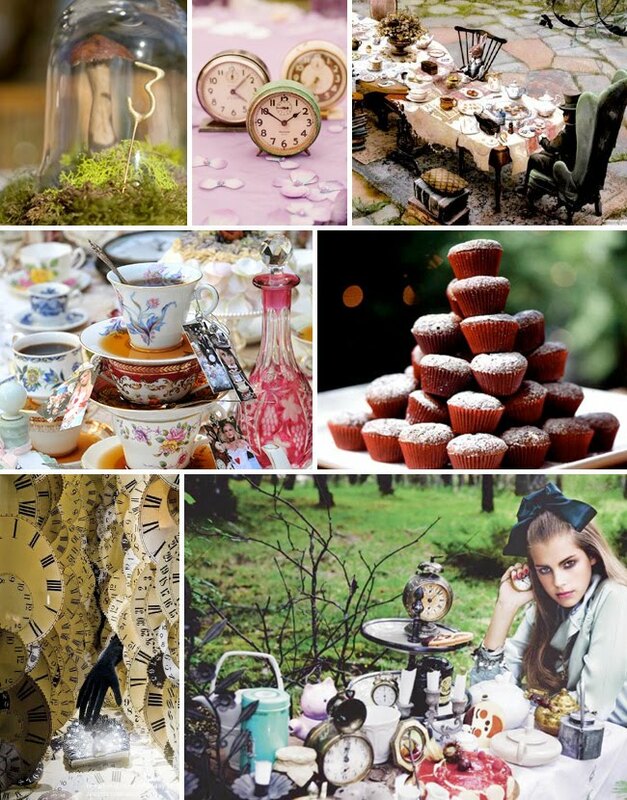 I've been planning my best friend's bridal shower with an Alice in Wonderland theme. This is great inspiration for me! sooo looking forward to see this movie… love the post! I just have to say that your blog is gorgeuos!! I love it! What a creative idea! I'm planning an outdoor wedding, so this caught my attention. The photos look whimsical but almost elegant at the same time. And having all those "I'm late for an important date" clocks around is a nice wedding theme (think timeless). i love all these photos!! I LOVE this! Perfect! Alice and Wonderland themed anything is fantastic. And Twigs & Honey pieces! hooray!! I would never have thought about this! 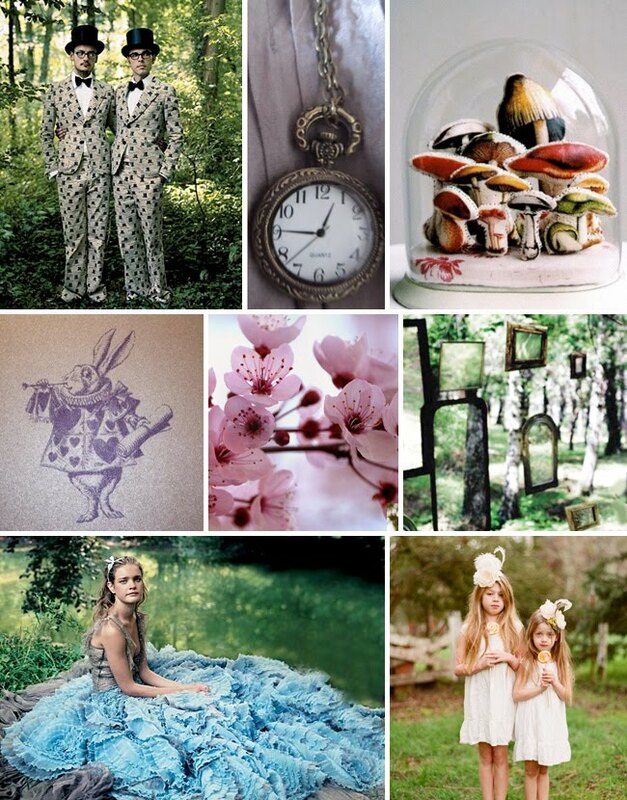 I would love an Alice in Wonderland wedding! That would be totally gorgeous. Mushrooms, clocks, mirrors, rabbits, and hookahs? Oh this is the best idea by far!